You’ve prepared for the birth of your baby, you’ve bought all.the.things a baby could need BUT have you thought about you? Planning for your postpartum recovery is essential as you move into the uncharted waters of new motherhood! Your placenta is made by you, JUST FOR YOU! So what is placenta made up of? Many new mums, just like you, report having more energy, feeling emotionally balanced, having great milk supply, less bleeding, less tired and less overwhelmed with caring for their newborn. What method is right for you? Ancient Chinese practitioners would warm the new mother inside and out - warming food, warm energy (qi) and warm environment. Traditional Method utilizes the warming energy of lemon, ginger and chilli in the steaming process to nourish your body and rebuild your blood after birth. It is also believed cooked foods are more easily digested by the newborn mother, iron is better absorbed and the steaming process helps to eliminate any surface bacteria. (note: nothing is added to the capsules or placenta, lemon,ginger and chilli are placed in the steaming water only) You may choose to omit the lemon, ginger & chilli and choose the Steamed Method instead. If you have a history of PMS or other mood disorders choosing a steamed method has anecdotally be found less stimulating than the RAW start method (which I choose NOT to provide). A Placenta Tincture can be added to your encapsulation service to extend the use of placenta remedies. A very small piece of cleansed fresh raw placenta is placed in high strength alcohol and allowed to infuse for a period of 6 weeks - gently shaken every day. Only a few drops of tincture is needed in times of stress or hormone imbalance. Your very own rescue remedy! 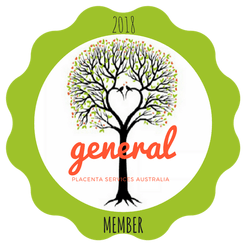 ** Recent media about GBS and ingesting placenta capsules ** Rest assured I practice with strict preparation safety and sanitation protocols - following all State guidelines regarding Safe Food Handling & Blood Borne Pathogens - here are the official responses from APPA and Placenta Services Australia. If you have any concerns please contact me and we can discuss in further detail. For this reason I choose to only offer a preparation method including steaming as an additional precaution against GBS. Your choice of capsules - plain gelatin, vegan, flavoured capsules: berry, lime, bubblegum or a mix of all flavoured capsules. INCLUDED OPTIONAL EXTRA: cord keepsake free of charge. Utilize your placenta remedies long after your capsules are finished. Preserved in high quality alcohol (vodka) a few drops can be taken at times of stress, hormonal upset or imbalance, fatigue or upset. Can even be kept for menopause. The perfect companion for your capsules. 'I had a general feeling of well being and I think it was due to my body being replenished with all of the wonderful healing properties of my placenta. I'm concerned about safety, how can I be sure this is my own placenta? I can absolutely understand these are concerns for many women when trying to decide if encapsulation is right for you. Your placenta is labeled with your name and date of baby's birth, it is stored in my placenta only refrigerator in my purpose built placenta preparation space. Only one placenta is processed at a time in the rare case I have two in my possession. I use a combination of single use and sanitised reusable equipment. I have the highest standard of training and follow universal precautions for blood borne pathogens. As part of my certification my preparation space and sanitisation process is submitted to be approved by the APPA board. To maintain my certification this process is reviewed every 2 years.